My family had several good horses as I was growing up, including a black part-Thoroughbred mare named Scrappy that my Dad bought from a high school boy named Lynn Thomas (whom I later married). Scrappy did a smooth, fast singlefoot instead of a trot. I was curious about her ancestry and discovered that her mother was a pacer. Scrappy was one of my 4-H projects. I raised my first foal from her, a half-Arabian filly named Khamette, born in 1959. 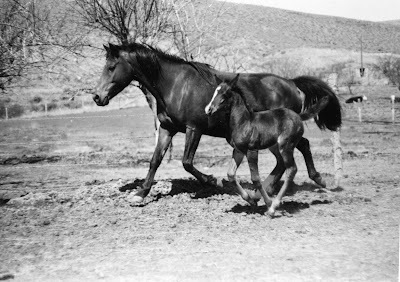 That filly became a versatile ranch horse (cow horse, kid horse, pack horse), and though she is long gone — I had to put her down at age twenty-five due to severely arthritic knees — she had three grandsons. Two are still on the ranch. My youngest grandchildren are now riding “Khamahn” (nickname “Veggie”), who is twenty-four years old. When Lynn and I were married in 1966 and started purchasing the ranch from my parents (along with another small ranch), we began raising crossbred cattle. Our composites cows are ambitious range cattle and very athletic, using our steep mountain pastures with ease. We continued raising horses, since keeping track of cattle on the range requires good horses. 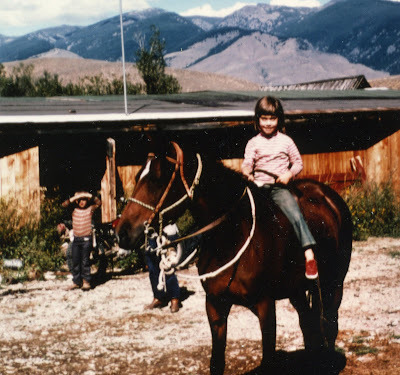 For more than 40 years I rode nearly every day during summer, checking gates and fences (repairing fences when trees blew over them or elk tore them down), water troughs, and so on, and trying to see all the cows and calves. If we find a problem, we can fix it; for instance, gather strays if someone leaves a gate open or bring home a cow or calf that needs treatment for pinkeye or footrot or some other problem. Our two kids learned to ride at an early age, tagging along with me riding range. 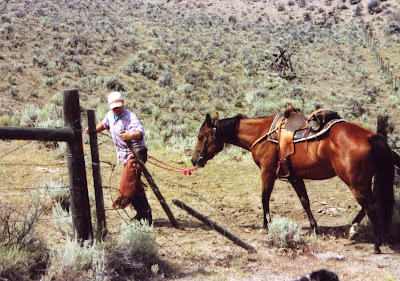 Lynn was usually busy haying and irrigating, and I was the range rider. The kids started riding old Khamette before their little legs were long enough to reach below the saddle pad. She could hardly feel them kicking, so they used a small switch to make her go. At first I ponied her alongside my horse on a lead line; she led so well that I could chase cows with Khamette and kid in tow. She could walk, trot, or gallop beside my horse or drop back behind if we had to wind our way along a narrow timbered trail. The kids gained confidence on her, since they had their own "reins" but Mama was in control, and the smart old mare couldn't stop and eat grass along the way. 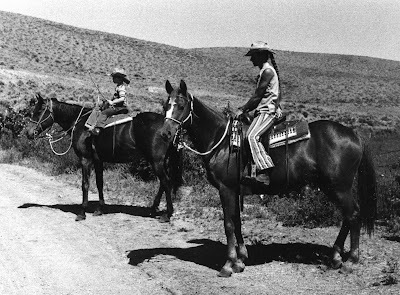 During the 1970s we did some endurance riding with our ranch horses; they were already well conditioned for distance riding from their regular work on the range. We often rode 5 to 8 hours daily, checking cattle, gates, and so on, usually at a trot to cover the distances involved. I did endurance competition on Nikki, my half-Arab cowhorse out of Nellace, but even more on Fahleen and Ahmahl (full sister and brother to Nikki). The summer Fahleen was seven she carried me more than 2,500 miles — most of it riding range. Our kids did some competitive distance riding, too, when they were old enough. Daughter Andrea's first competition when she was nine earned her an award for being the youngest rider on the oldest horse (Khamette, who was twenty-one by that time). I've always appreciated good ranch horses who have willingness and heart — the desire to do whatever they must to get the job done. We often have to move or chase cattle in difficult terrain, so our horses must be agile and sure-footed as well as speedy, with the endurance necessary to put in a hard 12-hour day when gathering and moving cattle. This is why we like part-Arabs as ranch horses; they have the endurance to work hard, day after day. And they put a lot of enthusiasm into their work. Like the time I was trying to head off a big horned Hereford bull on Ahmahl. The bull was trying to prevent his harem from being moved out of their pasture and was racing me to the front of the herd. He turned on me and threatened to hit my horse with his horns. Without hesitation, Ahmahl put his ears back, reared up, and struck the bull in the face with his front feet. It startled the bull so much that he backed off. grew up to be the next-best cowhorse I ever had. Nikki was probably my best cowhorse. She was a little high-strung and nervous, but if we were working cattle, she was totally serious and all business; she loved working cattle as much as I did and knew exactly what to do, without any cues from me. She was the most sure-footed and agile horse we ever had. I could chase cows on her through logs and bogs or full speed down a steep rocky slope or frozen hillsides, and she always kept her feet. Even in her older years when she was stiff and semiretired, I could grab her out of the pasture in an emergency and use her when I needed a really good horse for a really tough job, even in midwinter on ice and snow. Her son Nikkolis (3/4-Arab grandson of old Nellace, the Thoroughbred mare) was probably the next-best cowhorse I ever had, with great heart and agility. We've had a lot of good horses over the past 44 years, including Lynn's QH mare Bambi, our son's Appaloosa Brownie, many Arab-Thoroughbred crosses, and one Morgan. We’re not fussy about the breed, as long as a horse has the ability and endurance to do the job and can stay sound with many miles of hard use. 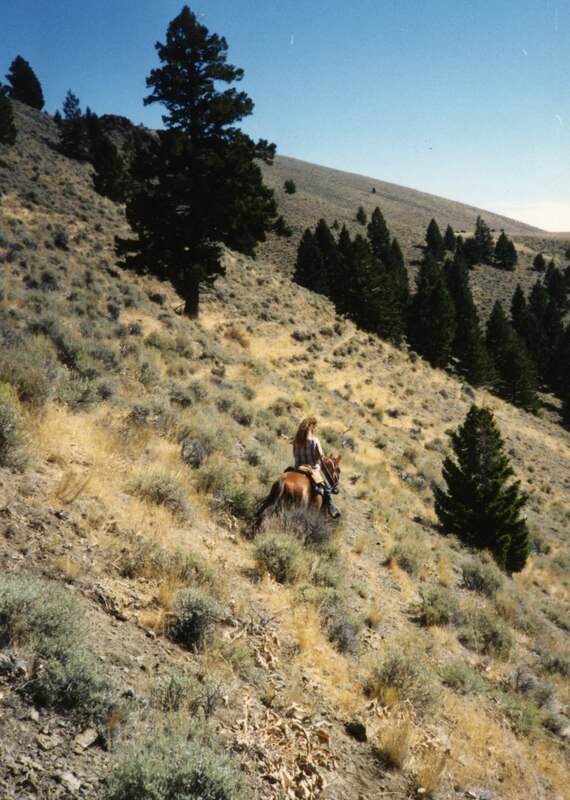 Speed and cow-cutting ability is not enough; our horses must be able to do it in rugged terrain, uphill and down. That's when you really appreciate an exceptionally good horse who gives you everything he's got and enjoys the job as much as you do. Our daughter Andrea's Anglo-Arab mare Snickers embodied that kind of heart and desire and would go anywhere necessary to head a cow (just like my old mare Nikki). One fall when we were bringing home some open cows to sell — and having a tough time moving them through the thick brush along the creek — one old cow ditched out through the brush, and the only way to head her was to get through or around a big fallen tree. Snickers didn't hesitate; she jumped the tree, even though the trunk and limbs were too thick and wide to jump. She landed on the big tree trunk and pushed off again, making a spectacular double jump that cleared the whole tree, and was able to head off the escaping cow. Daughter Andrea helped me train many of our young horses. Now granddaughter Heather (age nineteen, our son’s daughter) is also becoming a good horse trainer. Our son and his family now use our cattle range and part of our ranch. They also lease several other ranches and have 360 cows — and 13 horses. They run cattle on two different ranges and move cattle from ranch to ranch, so they need good horses. Riding range is the best way to train young horses. We may do groundwork with them at age two or three and get them started in the basics, but we don't do long, hard work with them until they’re four, old enough to physically and mentally handle the work. But getting a green horse out in the hills checking cattle and fences is good education for a young horse. "Sagebrush 101" is the best teacher, as they learn about rocks and logs, hillsides and bogs, crossing creeks and gullies, deer jumping out of the brush, and grouse flying up in their faces. They never get bored and sour (as can happen doing arena work), and they can see a purpose in what we’re doing. This on-the-job training makes well-educated, sensible horses. It's a beautiful combination. The ranch needs good horses for cattle work and range riding, and good horses need a place to be used, an outlet for their talents and abilities. We’ll always need good horses on our ranch, and our horses will always enjoy the work. Howdy! My daughter gave me a copy of Range magazine for Father's Day! I read the article about wolves and when I read the by-line --- I stopped. I remember a book by Don Ian Smith where he mentioned his daughter, Heather and her horse Nellis. His profound words have influenced me for most of my adult life. His wonderful way of illustrating faith-concepts in nature and daily life are very special. I am grateful that I could and can still be influenced by his words. I have been blessed to have had access to two of his books. I hope this will make you aware that his ministry continues and I am grateful for that. I hope we cross trails someday.